I have to say that my homemade mooncakes are never the same as the store bought mooncakes. All because my subconscious tells me that I have baked these mooncakes with all my love - LOL! ... thus with the most moderated amount of fat and sugar. Without the adequate fat and sugar, I can't deny the texture of my homemade lotus paste in these mooncakes is never as smooth as the commercially made ones but I can assure you that these 100% home baked mooncakes can be as tasty as the commercially made ones if you see them in different perspectives. Different perspectives? After enjoying a reasonable amount of smooth and rich mooncake, do you feel like you are satisfied but sort of had enough? Is this a good feeling... or bad? To me, the enjoyment of the deliciously rich mooncake always end sadly after I swallow the last mouthful of them. To ease my digestion, I always have to drink warm Chinese tea or any acidic drinks after munching the mooncakes. 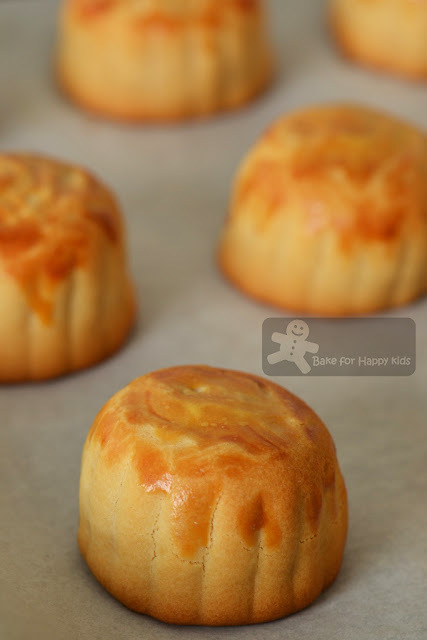 I hope that I don't sound like I'm hard selling saying this... My less sinfully homemade mooncakes like these mini custard mooncakes and thousand layer flaky yam mooncakes never give me the had-enough after feeling and yet they can be nice and satisfying with its mildly sweet taste. Ingredients that I have used to make the traditional pastry. 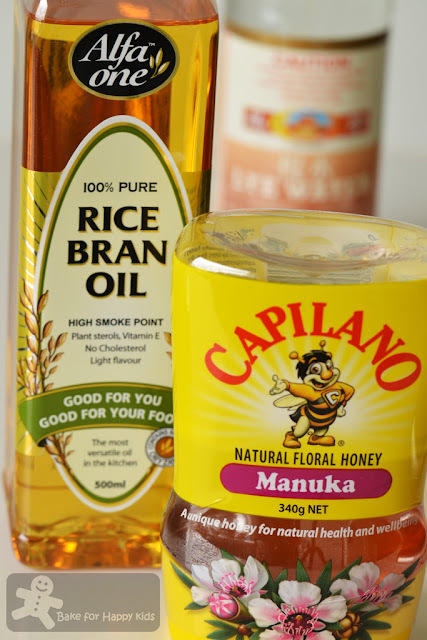 Instead of using golden syrup or any homemade syrup, I have used honey. 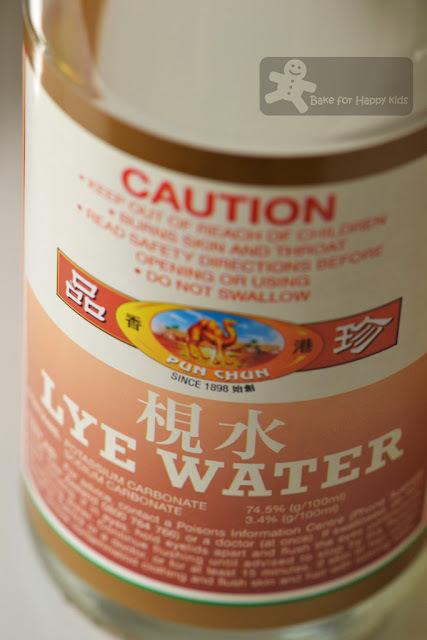 To some people, the use of alkaline water (lye water) is scary for them. Nothing scary here. Alkaline water acts like bicarbonate in baking. Hence, a small amount of this is commonly used as a leavening agent and also a preservative in traditional mooncake. This is what I did to make the pastry - Easy! These lotus paste are made from scratch. Recipe is at here. 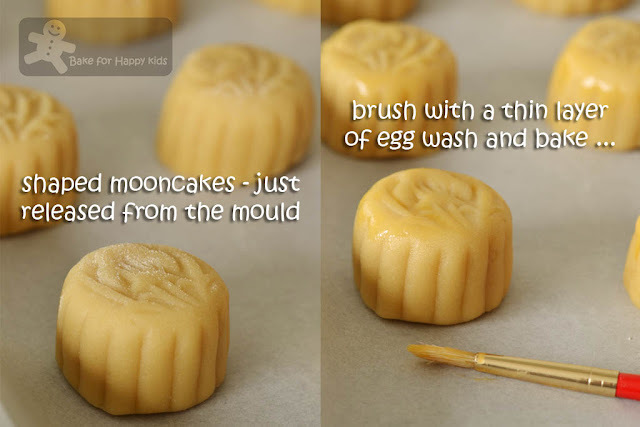 You can make these mooncakes in any shapes and sizes all according to the mould that you use. The mooncakes will crack a little but will shrink to look ok when they are completely cooled. Satisfying with no guilty feeling! *This amount is the best amount to use with my homemade lotus paste. 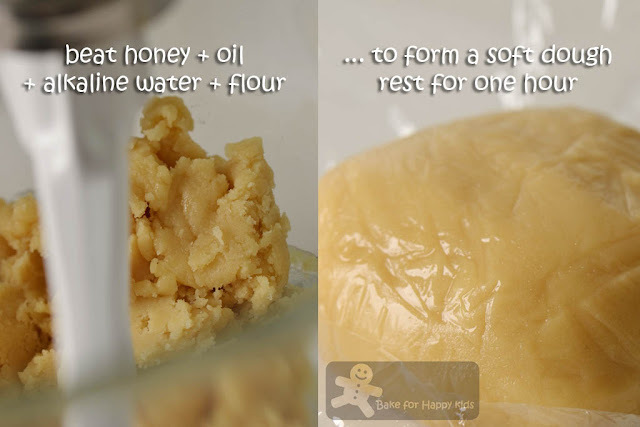 You can use lesser honey if your paste is too runny to roll. If your paste is too soft and runny, you can firm it up by chilling it in a refrigerator for at least 30 mins. Using an electric mixer with paddle attachment, beat honey, oil and alkaline with medium speed until combined. Add flour and continue to mix with the lowest speed to form a soft dough. Wrap dough with cling wrap. Set aside to rest at room temperature for at least 1 hr. 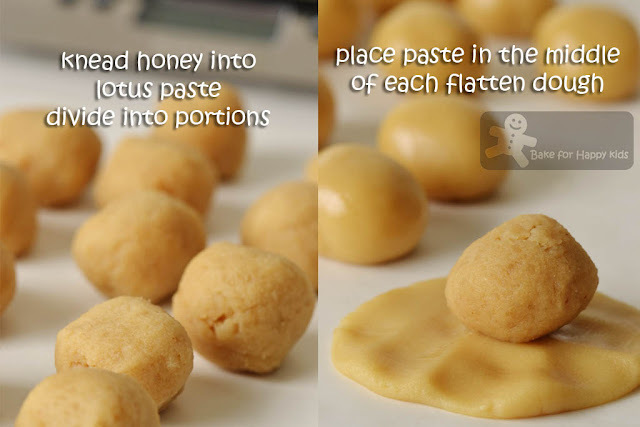 Knead honey into the lotus paste until fully combined. Like I have said at here before... As every mooncake mould is different, you have test the amount of dough and filling required to fill in each mould. To test, fill the mould with the maximum amount of pastry that you can fill and weigh the piece of dough. Mine is 40g each. For mooncakes with thinner pastry, 40% of each mooncake can be pastry and 60% can be filling but shaping mini mooncake with thin pastry can be challenging and so I have 40% of my mooncake to be filling and 60% to be pastry. Divide the filling into 18g each and pastry dough into 22g each. Shape each into balls. Set aside. Using a lightly floured hand, flatten a portion of pastry dough into a flat and round circle. Place a filling in the middle of the flatten dough. Enclose the filling inside the pastry and roll them into smooth balls. Place each ball into a lightly floured mooncake mould and press it gently until all the edges of the mould are well-filled with the pastry. To release the mooncake from the mould, keep knocking the mould on tabletop at the sides of the mould to loosen the mooncakes from the mould and allow the mooncake to release off onto the lightly floured surface. Preheat the oven to 180°C. Line two baking tray with baking paper. Place the shaped mooncakes on the prepared tray. Brush with a thin layer of egg wash and bake for 5 min. Remove and brush with second layer of egg wash and bake again for 5 min. Decrease oven temperature to 160°C. Remove and brush with third layer of egg wash and bake again for 5 min or until golden brown. Allow all mooncakes to cool slightly on the tray for 10 mins and transfer them to a wire rack to cool completely. 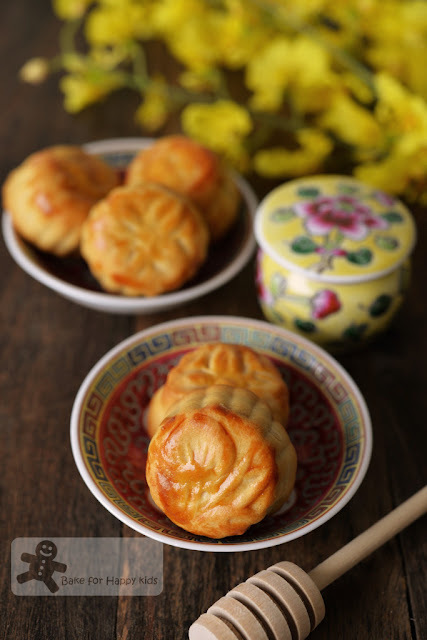 Allow the mooncakes to rest in room temperature for more than 48 hours before serving as the freshly baked mooncakes can be cookie-like but on the next subsequent days, the moisture, flavours and texture of these mooncakes will develop. 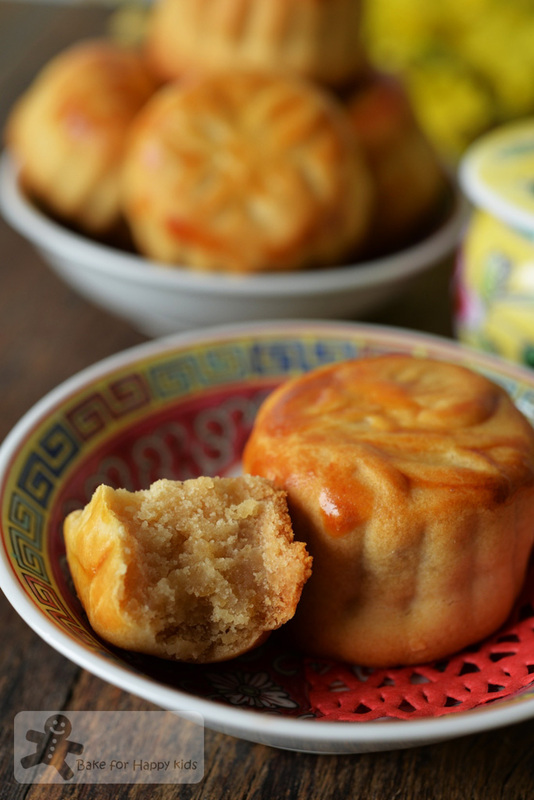 Zoe, I am sold on your homemade mooncakes and homemade filling! Definitely a safer and healthier option to the store bought ones. We don't know what sort of oil they use and besides too much sugar, they also contain preservatives. And so expensive too! Beautiful and amazing. You are just too great in baking anything. I salute you, Zoe. I know that I can't make this well at all. I've never heard about mooncakes...yours look so perfect. Wish I have the time to make homemade paste too ... Oh these lovely Honey Mini Mooncakes of yours looked so inviting :) Agree ... satisfying with no guilt feeling ! How nice if I could have some. Yum ! I find these so beautiful..have bought molds..mine did not turn out so well..
HI Zoe, first time of seeing mooncake recipe using honey! I baked 3 batches of mooncakes, yesterday & today & no more for this year. The lye water that you have provided here can't be found from here. I was able to get it I think 2 years ago but last year, I walked for a few shops still couldn't get it. Finally spoke to a shop assistant, she said the government had taken it back. I still can't seen it this year so I asked my Jap friend gave me some of it from her alkaline-made machine. The PH is low, about 10. I haven't tried my traditional mooncakes, still waiting for them to turn soft. can we just use soda bicarbonate instead of lye water? It's hard to find the water in the UK. Hi, Sorry that I'm not sure if the use of baking soad will work as well as lye water as I have not try this substitution before. Cheers!